After a 3 day rest in Minnesota, Mark was back at it today– bright and early! We left the motel in Onawa at 4:30 a.m. (!) so I could take him back to Jackson, Nebraska, the last stop he biked to before we drove up to the Twin Cities for a much-deserved rest. 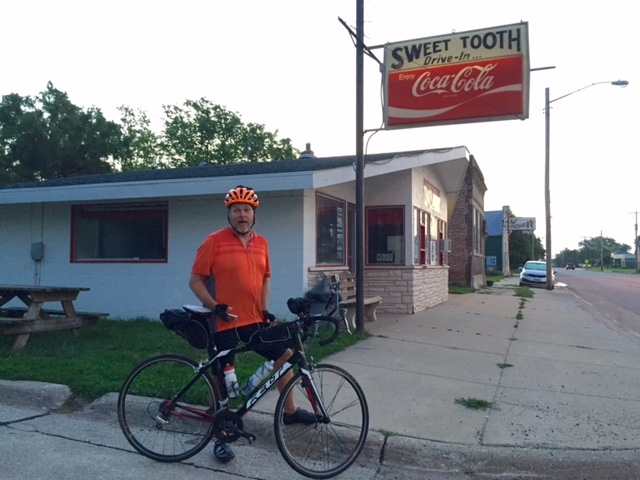 (Side note: The Sweet Tooth Drive-In has amazing ice cream and the best malts on Highway 20 in Nebraska, but unfortunately it wasn’t open early this morning!). Mark was hoping to beat the oppressive heat that is stifling this part of the country. Did he manage to do that? Read about it here on his blog. MELODY: Had a wonderful 3 days visiting with friends in Minnesota but now it’s back to work. Packing. Unpacking. Grocery shopping. Making Mark’s PB & H sandwiches, filming, uploading, downloading. I can’t remember the last time I got up at 4 a.m. except to travel overseas! But it was worth it when I saw Mark cross the border to another state about an hour later. Congrats, Mark! I still can’t believe he has pedaled almost 2000 miles across the United States from Oregon. I’m a proud wife. 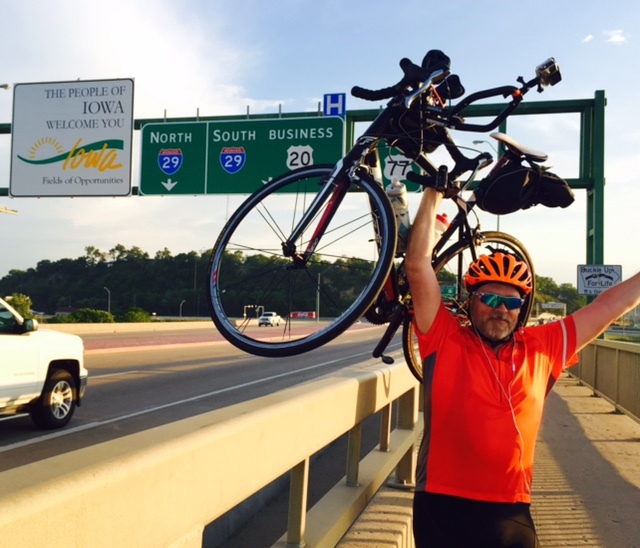 Iowa– the 5th state Mark has crossed since starting in Oregon in June. I’m having some fun with my new 360 Ricoh Theta camera. 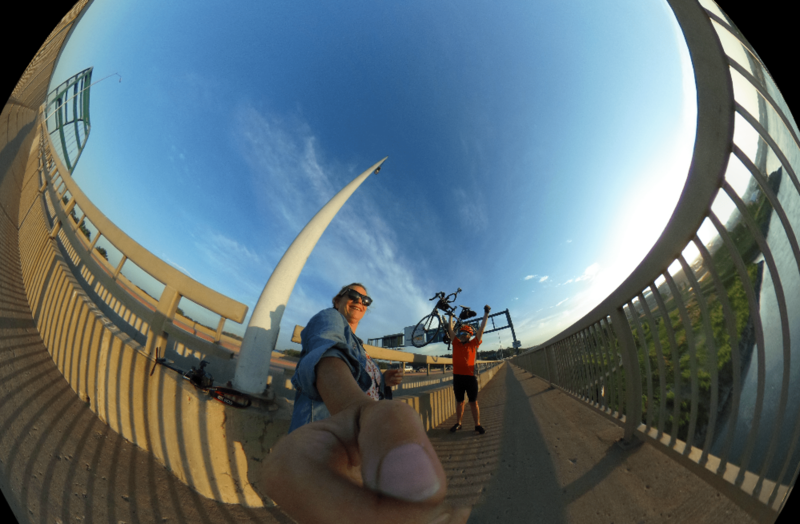 Click here to see a 360 view of what it was like to be on the bridge to Sioux City with Mark today at the Iowa sign (the pic below is just a screen grab). Starting on Sunday, we’ll be at Ragbrai ( a bike ride across Iowa with 10,000 close and personal friends), so don’t expect daily updates from us. We’ll do our best to post some pics when we can. Excited to share that adventure with our daughter Jenna, her boyfriend Alex, cousin Sally and her daughter Shannon, cousin Mike and some other friends. Next chapter: Biking with People! Thanks for following along on our journey. You can also follow us on our Facebook page here.